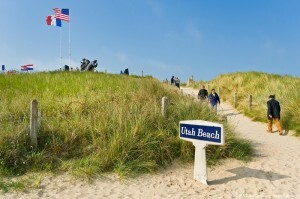 Utah Beach was the code name given by the Allies to the beach of la Madeleine in Sainte-Marie-du-Mont. 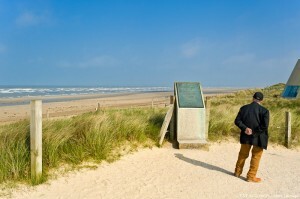 This beach was the first landing zone, chosen by the English General Montgomery. Utah Beach is the most westerly of the five landing beaches and includes part of the coast of la Manche, from St Germain de Varreville to the left bank of the Vire estuary. It was expected that the Allies would arrive there at the same time as those who had landed on Omaha beach, situated 15 km to the east. On the night of 6th June 1944, at around 3 am, 9 battalions of the 4th Infantry Division were transhipped to reach a point 18km off the coast, away from the German batteries. With 12-meter-high waves, the men struggled to move from one ship to another. At 4.30 am that day, the invasion began on the beach of la Madeleine, in Sainte-Marie-du-Mont. 22,000 men and 1,800 vehicles landed on the coast of Cotentin and established the link between Utah and Sainte-Mère…. The Normandy landings were due to start at 6.30 a.m., just after low tide; this was to allow demolition crews time to clear the beaches of obstacles. At 6:30 am, the 8th Regiment of the 4th Division led by General Barton arrived, backed by amphibious tanks. Behind Utah, 7 German bases of operation and 20 batteries were dotted along the coast. The w5 blockhouse guarding the road to Sainte-Marie-du-Mont came under heavy Allied bombing. 300 meters inland from the shore, Allied unit commanders used smoke signals to stop the Allied bombing. This sowed confusion as well as restored calm. At 6.31 am, 10 barges unloaded 300 men about 100 meters from the beach. All was quiet. The Germans were in shock; they had not expected a landing on that area. A strong current had caused Allies to veer 2 km south from the initial landing area. 12 huge amphibious vehicles charged out of the water and 16 others were approaching under the stunned gaze of the Germans. The W5 blockhouse was destroyed by 600 men led by General Theodore Roosevelt, the eldest son of the former and cousin of the then current US President. 30,000 men and 3,500 vehicles landed 2 km from the planned zone. There began their mission. When the Germans turned to the beach, things were already well advanced. An hour after the first landings, the ground was cleared. Two hours later, the tanks had crossed the Atlantic Wall and spread out over a 3km front. Blockhouses fell one by one. By the end of the day, 23,250 men had landed in Normandy. Losses were estimated to 197 dead and 60 missing, 10 times less than what had been feared. Many monuments have been erected around the D-Day Museum in Utah Beach in order to celebrate the various units which participated in the Normandy landings, including the 90th and 4th Divisions.